Sonoran desert with saguaro cacti, Arizona. 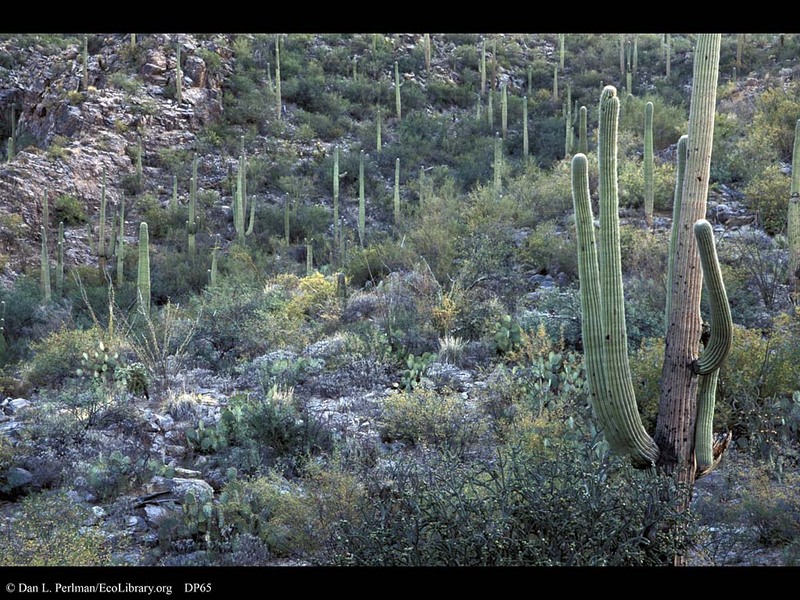 Saguaro, the archetypical cactus, actually has a rather limited distribution, as it is only found in southern Arizona and northern Mexico. These giants of the desert can reach 50ft (about 15m) in height and 10 tons (9,000kg) in weight, and they can live 200 years. They are marvelously adapted to life in a dry climate, with wide spreading roots that can quickly gather water from the infrequent rains of the region. All of the other plants in this image exhibit their own adaptations to a dry climate, such as small and thickened leaves.